In the reign of the same caliph, Haroun-al-Raschid, of whom we have already heard, there lived at Bagdad a poor porter called Hindbad. One day, when the weather was excessively hot, he was employed to carry a heavy burden from one end of the town to the other. Being much fatigued, he took off his load, and sat upon it, near a large mansion. He was much pleased that he stopped at this place; for the agreeable smell of wood of aloes and of pastils that came from the house, mixing with the scent of the rose-water, completely perfumed and embalmed the air. Besides, he heard from within a concert of instrumental music, accompanied with the harmonious notes of nightingales and other birds. This charming melody, and the smell of several sorts of savory dishes, made the porter conclude there was a feast with great rejoicings within. He went to some of the servants, whom he saw standing at the gate in magnificent apparel, and asked the name of the proprietor. "How," replied one of them, "do you live in Bagdad, and know not that this is the house of Sindbad the Sailor, that famous voyager who has sailed round the world?" The porter lifted up his eyes to heaven, and said, loud enough to be heard, "Almighty Creator of all things, consider the difference between Sindbad and me! I am every day exposed to fatigues and calamities, and can scarcely get coarse barley-bread for myself and my family, while happy Sindbad expends immense riches, and leads a life of continual pleasure. What has he done to obtain from Thee a lot so agreeable? And what have I done to deserve one so wretched?" While the porter was thus indulging his melancholy, a servant came out of the house, and taking him by the arm, bade him follow him, for Sindbad, his master, wanted to speak to him. The servants brought him into a great hall, where a number of people sat round a table, covered with all sorts of savory dishes. At the upper end sat a comely, venerable gentleman, with a long white beard, and behind him stood a number of officers and domestics, all ready to attend his pleasure. 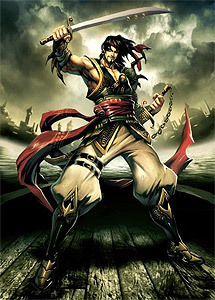 This person was Sindbad. Hindbad, whose fear was increased at the sight of so many people, and of a banquet so sumptuous, saluted the company trembling. Sindbad bade him draw near, and seating him at his right hand, served him himself, and gave him excellent wine, of which there was abundance upon the sideboard. Now, Sindbad had heard the porter complain through the window, and this it was that induced him to have him brought in. When the repast was over, Sindbad addressed his conversation to Hindbad, and inquired his name and employment, and said: "I wish to hear from your own mouth what it was you lately said in the street." At this request Hindbad hung down his head in confusion, and replied: "My lord, I confess that my fatigue put me out of humor, and occasioned me to utter some indiscreet words, which I beg you to pardon." "Do not think I am so unjust," resumed Sindbad, "as to resent such a complaint. But I must correct your error concerning myself. You think, no doubt, that I have acquired without labor and trouble the ease and indulgence which I now enjoy. But do not mistake; I did not attain to this happy condition without enduring for several years more trouble of body and mind than can well be imagined. Yes, gentlemen," he added, speaking to the whole company, "I assure you that my sufferings have been of a nature so extraordinary as would deprive the greatest miser of his love of riches; and as an opportunity now offers, I will, with your leave, relate the dangers I have encountered, which I think will not be uninteresting to you."